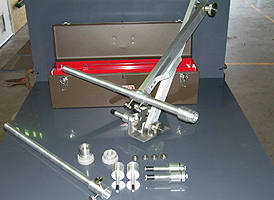 PSI - Plastic Stainless, Inc.
Anti Withdrawal Safety Devices we design and manufacture include chicken arms, plate package, and flange mount focus tube holders. 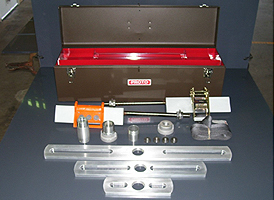 Anti-withdrawal device used in hydroblasting and is constructed out of heavy gauge aluminum that is both light weight and durable. All hardware is made out of stainless steel. Mounts on a tube with or without a flange. Prevents premature withdrawal of high pressure hoses and the risk of injury and death caused by the inadvertent withdrawal of the hoses. Comes with various sized bushings to fit different hose sizes. Additional focus tube lengths available. Packaged in a light-weight and durable tool box for easy transport to the job site. For more information on these and other excellent products available, please contact Plastic Stainless, Inc. at (361) 758-0602 or mark@plasticstainlessinc.com. Anti-withdrawal device mounts on a pipe or tube for ease of hydroblasting preventing the live nozel from exiting the tube unexpectantly. Comes in three sizes with additional sizes available. Bushing holder can be modified to accommodate larger bushings. Tool box is included. 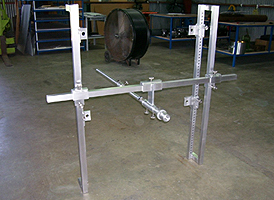 The flange mount focus tube holder comes in various sizes and can be mounted vertically or horizontally.